YouTube is maybe one of the most popular website available out there, the same being used by probably all the users who have access to Internet. 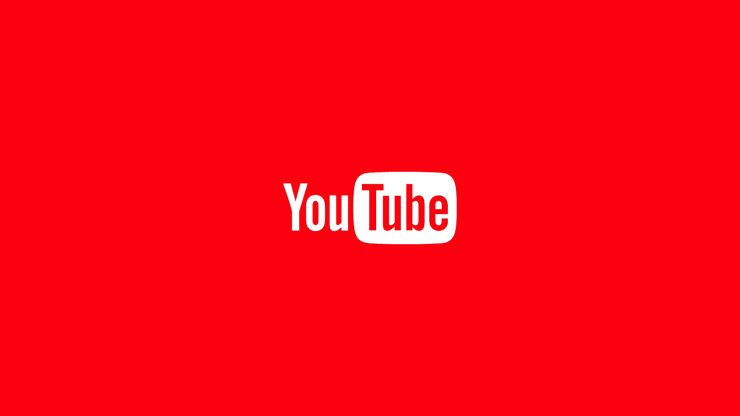 YouTube can be accessed from touch based, portable devices and also from desktops and classic computers whether the handsets are running on Windows, Android, iOS or any other platforms. Anyway, on Windows 8 and Windows 8.1 users reported a YouTube green screen issue which is quite annoying and which is making a stressful YouTube experience. In that matter during the lines from below I will show you how to easily fix the YouTube Green Screen problem in Windows 8 and Windows 8.1. In most of cases the YouTube green screen issue is being reported by Windows 8 users who are using Internet Explorer as their default web search engine. Basically, while you are watching a video on YouTube suddenly you can see a green screen window, or from the start you can’t play your video as the green screen is being displayed. 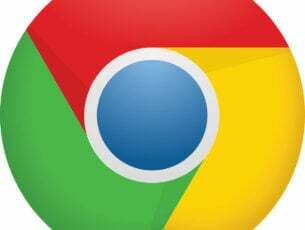 Now, you can choose to try a different web browser program, such as Google Chrome, though you can keep IE and get rid of the green screen issue by following the steps from below. YouTube videos green and distorted – Many users reported that their videos are green and distorted. This is most likely caused by your drivers, but you should be able to fix the problem by updating them. YouTube video green screen Firefox, Chrome, Internet Explorer – This problem can appear on almost any web browser, and users reported this issue on Firefox, Chrome, Opera and Internet Explorer. However, you can fix the problem simply by disabling hardware acceleration in your browser. YouTube green screen crash – Sometimes your browser might freeze or crash after getting a green screen on YouTube. This is most likely caused by problematic or outdated drivers. YouTube green screen Windows 10, 8.1, 7 – This problem can affect any browser on any version of Windows. However, the solutions are almost the same for every version of Windows. YouTube green screen playback, audio only, no video – Many users reported that they don’t have video during YouTube playback. Even though the video doesn’t work, audio works without any problems. YouTube green screen hardware acceleration – Hardware acceleration is the most common cause for this problem, and in this article we’ll show you how to disable it for all major browsers. In the search field enter internet options. 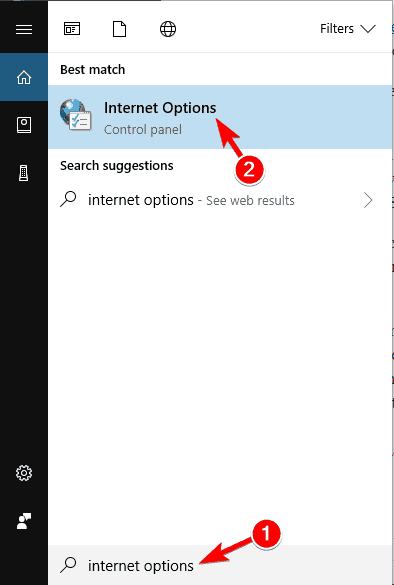 Now select Internet Options from the menu. 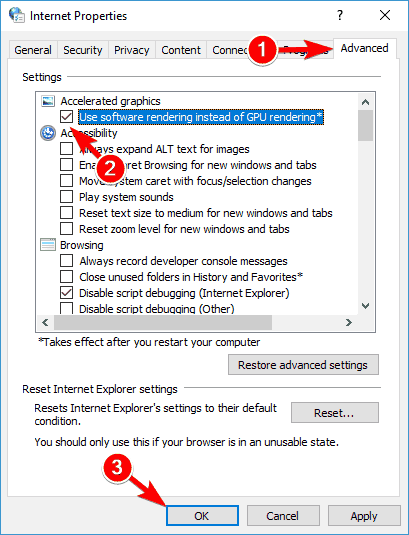 Navigate to the Advanced tab, and under Accelerated Graphics section check the Use software rendering instead of GPU rendering* box. Click on Apply and OK to save changes. 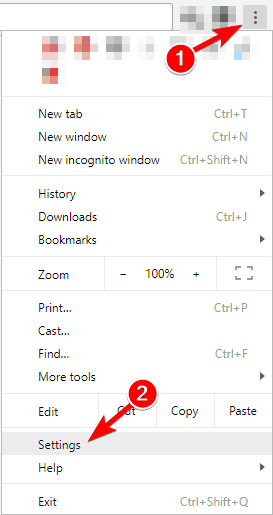 Click the Menu icon in the top right corner in Firefox and choose Options. Now go to the General section and scroll down to the Performance. 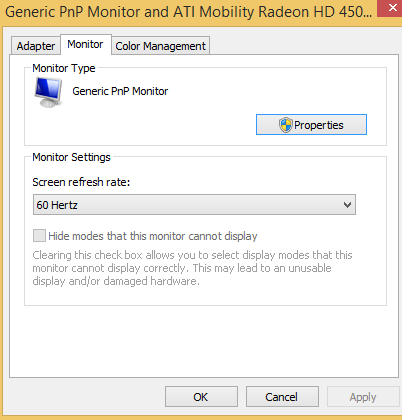 Uncheck Use recommended performance settings and Use hardware acceleration when available. Now close the options tab and hardware acceleration should be disabled on Firefox. In the top right corner click the Menu icon and choose Settings from the menu. When the Settings tab opens, scroll all the way down and click on Advanced. 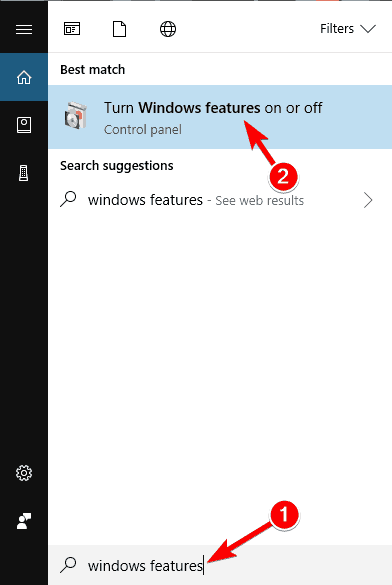 Scroll down to the System section and turn off Use hardware acceleration when available. After doing that, close Settings tab and restart Chrome. Once you disable hardware acceleration for your browser, the issue should be resolved and you won’t see any green screens while watching YouTube videos. Now, another solution that can be applied on Windows 8 and Windows 8.1 systems is implying in disabling the hardware acceleration feature. In order to do so, just follow the next steps. Press Windows Key + R and enter control. Press Enter or click OK. 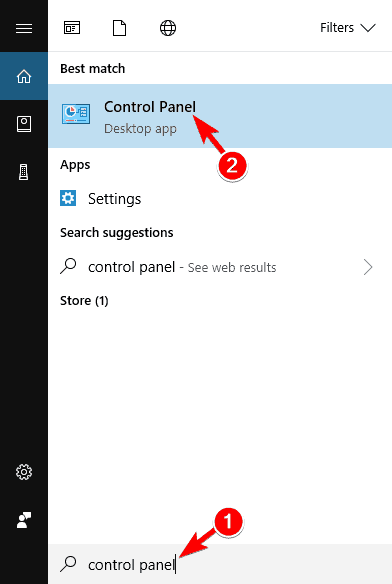 The Control Panel window will be displayed on your computer. Look at the upper right corner of Control Panel; under Category you need to select Small icons. Up next click on Display. Then choose Change display settings from the left side of Control Panel. Pick Advanced Settings from the window that will be displayed. Select the Monitor tab and choose High Color 16 bit option. Click Apply and then choose Advanced settings once more; this time go for Troubleshooting tab. 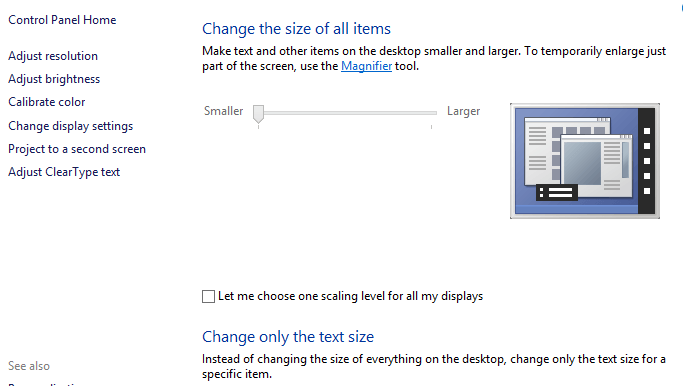 Select the Change settings option and just move the hardware acceleration pointer all the way to the left. Click OK and save your settings; that’s all. 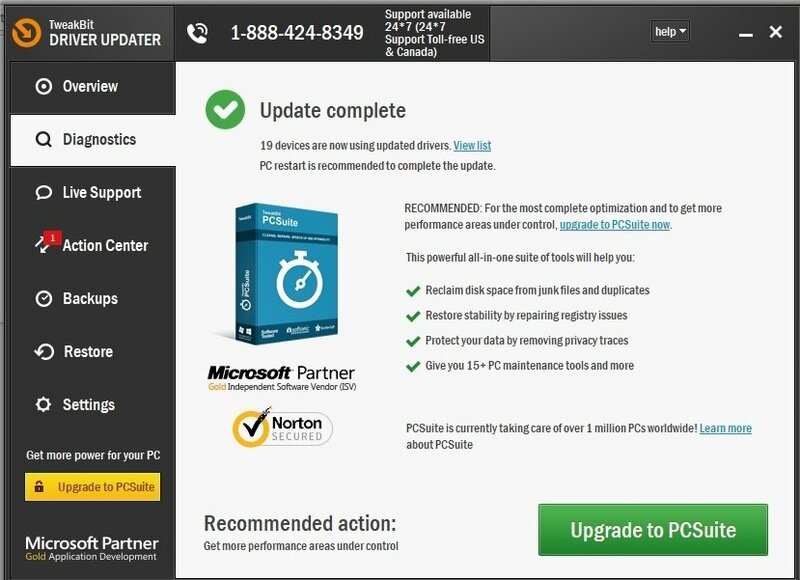 But if you’re still having issues on your PC or you simply want to avoid them for the future, we recommend you to download this tool (100% safe and tested by us) to fix various PC problems, such as file loss, malware and hardware failure. If you have problems with YouTube and green screen, you might be able to fix the problem by installing an older driver for your graphics card. Both AMD and Nvidia users reported this issue, and in order to fix it, you need to uninstall your driver and install an older version instead. 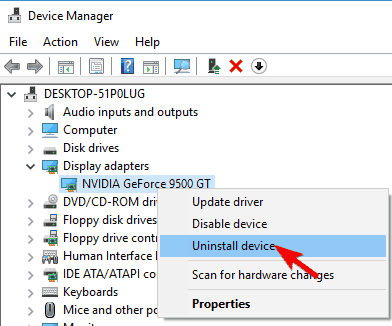 When Device Manager opens, locate your graphics card, right click it and choose Uninstall device from the menu. Check Delete the driver software for this device and click on Uninstall button. Some users are also suggesting to use Display Driver Uninstaller to remove all files associated with your graphics card. In one of our previous articles we wrote how to use Display Driver Uninstaller, so be sure to check it out for detailed instructions. Once you uninstall your driver, Windows will install the default graphics driver. Now you just need to download an older version of the driver for your graphics card and install it. We wrote a simple guide on how to update your graphics card driver, so be sure to check it out. If using an older driver doesn’t help, you might want to update your graphics card driver to the latest version and see if that solves the issue. 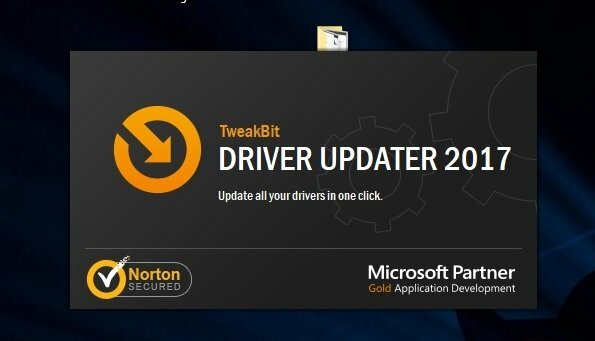 For that, we strongly suggest to do it automatically by using Tweakbit’s Driver Updater tool. This tool is approved by Microsoft and Norton Antivirus. After several tests, our team concluded that this is the safest and the best automatized solution. Below you can find a quick guide how to do it. Now list of features will appear. Locate and disable Hyper-V and all Hyper-V related features. Once you’re done, click on OK button to save changes. After disabling Hyper-V feature, the issue should be resolved and you’ll be able to watch YouTube videos again. In the left pane, select Troubleshoot. 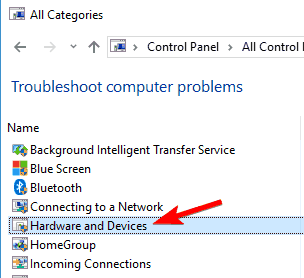 In the right pane select Hardware and Devices and click on Run the troubleshooter. Now follow the instructions on the screen to complete the troubleshooting process. When Control Panel opens, navigate to Troubleshooting. In the left pane click on View all. Now click on Hardware and Devices. Both of these methods will run the same troubleshooter, so feel free to use either of them. 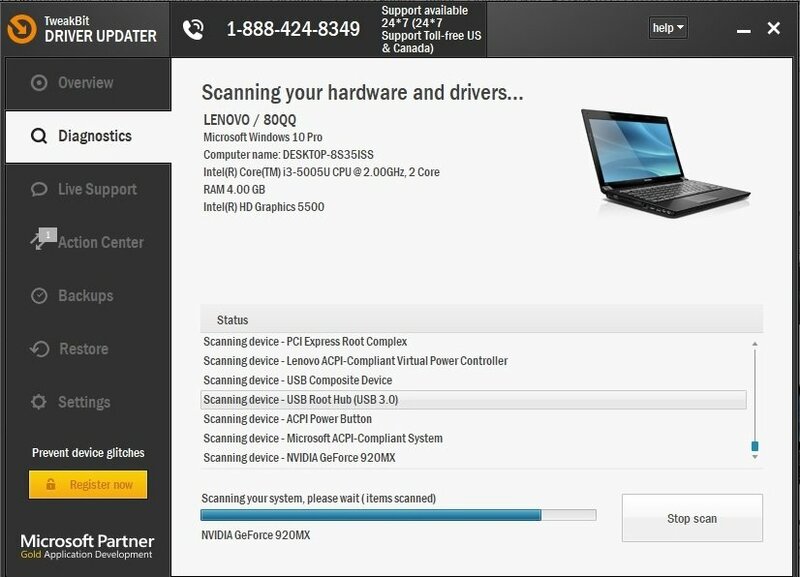 After the troubleshooter is finished, check if the problem is resolved. Play any YouTube video in your browser. Click the Gear icon and click on Quality from the menu. 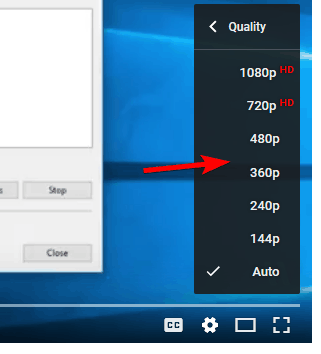 Now choose a different video quality from the list. After changing the video quality, the green screen should disappear and you’ll be able to enjoy in your video. Keep in mind that this is just a workaround, so you might have to repeat it for every video that has this problem. So, there you have it: that was how you can fix YouTube Green Screen issue in Windows 8 and Windows 8.1. Do share your experience and results with us via comments section from below.